"Neon tetras can control their brightly colored stripes by changing the angle of tiny platelets in their skin," says Chih-Hao Chang, an associate professor of mechanical and aerospace engineering at North Carolina State University and corresponding author of a paper on the work. "For this proof-of-concept study, we've created a material that demonstrates a similar ability," says Zhiren Luo, a Ph.D. student at NC State and first author of the paper. "Specifically, we've shown that we can shift the material's color by using a magnetic field to change the orientation of an array of nanocolumns." The color-changing material has four layers. A silicon substrate is coated with a polymer that has been embedded with iron oxide nanoparticles. The polymer incorporates a regular array of micron-wide pedestals, making the polymer layer resemble a LEGO brick. The middle layer is an aqueous solution containing free-floating iron oxide nanoparticles. This solution is held in place by a transparent polymer cover. When a vertical magnetic field is applied beneath the substrate, it pulls the floating nanoparticles into columns, aligned over the pedestals. By changing the orientation of the magnetic field, researchers can change the orientation of the nanoparticle columns. Changing the angle of the columns shifts the wavelength of light that is most strongly reflected by the material; in practical terms, the material changes color. "For example, we were able to change the perceived color of the material from dark green to neon yellow," Luo says. "You can change the baseline color of the material by controlling the array of the pedestals on the polymer substrate," Chang says. "Next steps for us include fine-tuning the geometry of the column arrays to improve the purity of the colors. We are also planning to work on the development of integrated electromagnets that would allow for more programmable color shifts." The researchers are working toward the goal of developing applications ranging from reflective displays to dynamic camouflage. 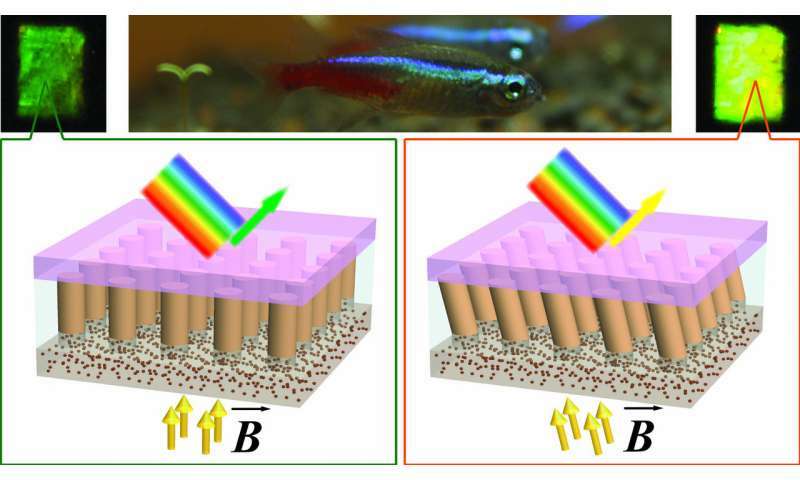 The paper, "Magnetically Actuated Dynamic Iridescence Inspired by the Neon Tetra," is published in the journal ACS Nano.